Description: A white smooth-skinned body and dark blotched tentacles emerging from a crevice are the characteristic features of this sea cucumber. There are five distinct double rows of long tube-feet.The spicules consist of flat rhombic plates with four holes, occasionally with two extra holes one at each end. 15cm in length, tentacles 10cm. 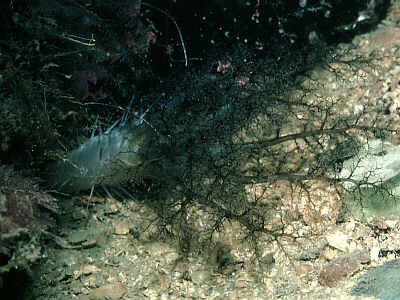 Habitat: Lives in rock crevices and beneath boulders in shallow water and on the lower shore. Common from the lower shore to the circalittoral zone. Similar Species: The tentacles of Aslia lefevrei are very similar and these two species often occur together. The white body is distinctive. White body, tube-feet in rows. Spicules flat with few holes. Picton, B.E. & Morrow, C.C. (2016). Pawsonia saxicola (Brady & Robertson, 1871). [In] Encyclopedia of Marine Life of Britain and Ireland.